Substantial savings on your Brecon Beacons Stay are on offer Sunday to Thursday. For a regular B&B couple sharing, the en-suite double room tariff mid-week is £140.00/ room - i.e. £70.00/ person based on two sharing. Two night stays midweek are discounted to £210 for two nights - i.e. £52.50 B&B / person per night based on two sharing - on our mid-week breaks deal. For Groups and Conference Delegates for two days or more, we offer group rates. These are only available on weekdays. B&B rates are not discounted at weekends except for short notice bookings should there be availability (typically in January only). Our Group Rates are for a minimum of ten guests, and based on two sharing an en-suite room. Single Occupancy of Double rooms is charged at the applicable discounted Double room rate - see table below for Group Rates at 10 or more Delegates. Sunday to Thursday Budget B&B for Groups 10 or > 10 is £35 per person B&B based on 2 sharing a non en-suite room. You will have the facilities of the main castle at your disposal, including the neighbouring hot tub and spa, excellent evening meals in the bar and use of castle lounges etc. Capacity in the Nurses Block is 19 - 9 doubles and one single. Nurses Block Accommodation is basic. When it was last graded, this block was 2 star Hostel Standard. However it is no longer tourist board graded as the current arrangement of 4 loos and 4 showers does not meet the number of loos required for the max capacity of 21 people. If we add a couple more loos, it might even go back to 2 star hostel standard! For Conferences and Mid week groups with above ten staying in the Hotel, single Occupancy of Nurses Block Rooms at £35 per Delegate is permitted Sunday to Thursday. 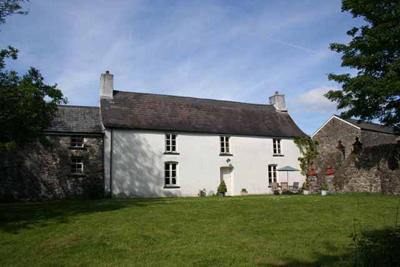 The Farmhouse is graded 4 star self-catering (excluding the annexe) and can take small groups of 6 - 8 persons. It has three bedrooms and two bathrooms in the main building and one further twin bedded loft bedroom accessed from the lounge, via a passageway into an adjoining annexe. The annexe (not graded for tourist board purposes) has its own kitchenette and separate entrance, making it suitable for an independent couple or children old enough to do their own thing. The Tariff is £850.00 a week self-catering in the high season and £699 per week self catering in the low / winter season. The farmhouse is graded four star. See the farmhouse.